Steelers Dared Tebow To Beat Them, And He Did : The Two-Way After another Tebow "miracle" on Sunday, the Denver Broncos are advancing in the NFL playoffs. Tonight, college football caps its season with the "rematch of the century" between LSU and Alabama. Denver Broncos quarterback Tim Tebow celebrates after beating the Pittsburgh Steelers 29-23 in overtime of an NFL wild card playoff football game on Sunday, (Jan. 8, 2012). Just as football fans around the country (outside of Denver, that is) were thinking that Broncos quarterback Tim Tebow was out of miracles because he hadn't played well in recent weeks, he came through Sunday on the first play of overtime against the favored Pittsburgh Steelers. As NPR's Tom Goldman explained on Morning Edition, the Steelers defense dared Tebow to throw — betting that his well-known problems with accuracy would come back to bite the young QB. So what did the Broncos do? Tebow threw to receiver Demaryius Thomas. Thomas outran the Pittsburgh defenders and 80 yards later the Broncos has beaten the Steelers 29-23. 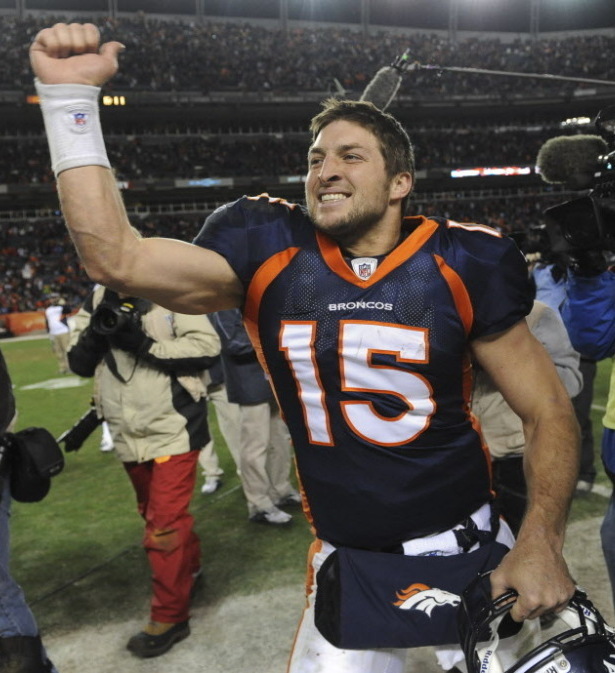 And as The Denver Post says, "Tebowmania" is back at full strength. If you need a football fix sooner than that, of course, there's tonight's college championship game between LSU and Alabama — a contest that some are calling the "rematch of the century." Earlier this season, No. 1 LSU beat No. 2 Alabama 9-6 in a defensive slugfest. Tom says tonight's game is also expected to be a low-scoring affair. Game time is 8:30 p.m. ET. The broadcaster is ESPN.